Our June update features some really excellent examples of B&G wood inlay, plus some unusual Otto Chlup marquetry plus the ever popular view of Stuttgart by the Buchschmid and Gretaux Wood Inlay Company.. This is a truly wonderful example of a B & G wood inlay picture. 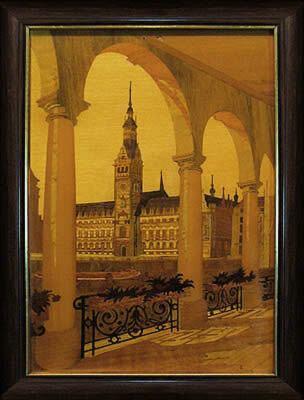 We also have a wood inlay of Hamburg by an unkown maker. Our June update brings you several wood inlay pieces which have somehow been sitting in our archives for a little while. Presumably they were originally placed there as they may have been requiring some Photoshop work to be made ready for publishing to the website. But for whatever reason they inadvertently got overlooked until our graphics editor discovered them in a "B & G to do" folder. So, although a little way out in time scale from their originally intended publishing dates, they are here at last for you to enjoy and appreciate with us. Let's start with picture number 1. The picture by Buchschmid and Gretaux is titled, we believe, "Tall Stories"and is one of the Group 1 larger picture series. This is the first example of this B & G picture that we have seen - and we are pleased to say that it is a rather attractive looking wood inlay picture. 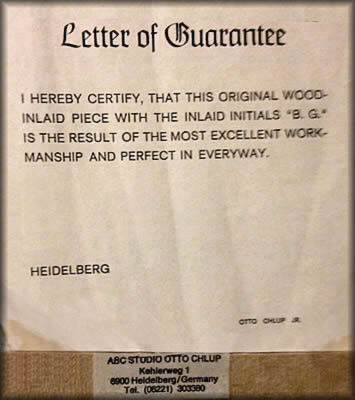 It is also good to see a "Letter of Guarantee" issued by Otto Chlup himself accompanying this picture. 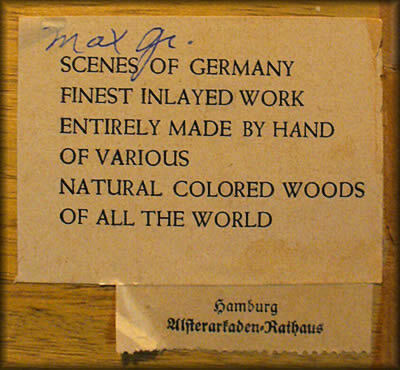 Otto was always very careful and selective with his documentation, so a guarantee from Otto is always a good way of verifying original and genuine B & G wood inlay pieces. And talking of Otto Chlup, the next picture we have here is a view of the Neckar River at Heidelberg made by the hand of, and signed by, no other than Herr Otto Chlup himself. Otto, as you probably know, was the third arm of the Buchschmid and Gretaux Wood Inlay Company triumvirate. 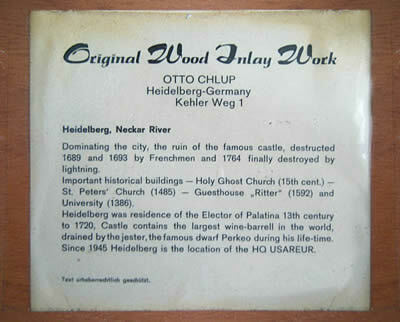 Otto often helped with the production of Buchschmid and Gretaux wood inlay work, and sometimes would produce wood inlay work under his own name, which is the case here. We do not see many Otto Chlup wood inlay pieces, so it is very pleasurable to find a fine example here. 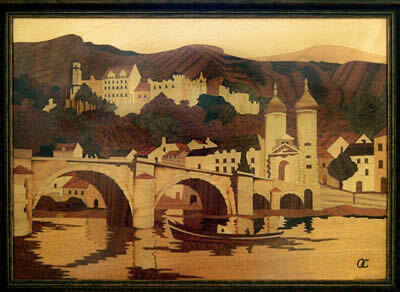 Otto has obviously made use of the Buchscmid and Gretaux "Neckar River, Heidelberg" template in his reproduction of that particular picture or design. But it is none the worse for it. Otto made a splendid job of the job, and merits approval of his work in goodly measure. 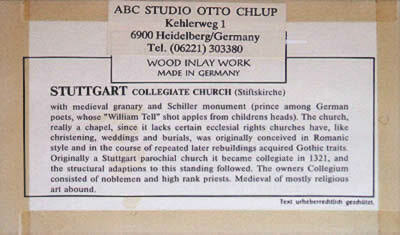 We also like the descriptive label attached to the rear of the picture, it is very comprehensive and gives a good history of the important buildings to be found in Heidelberg. 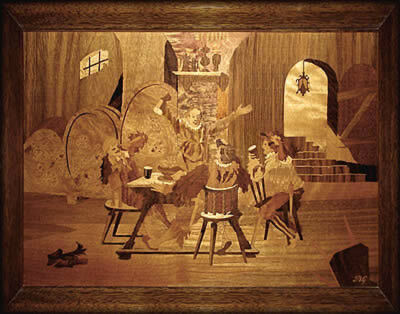 Our next picture is a lovely wood inlay picture of a scene in Hamburg. However, this picture doesn't appear to have originated from the studios of Buchschmid and Gretaux - or even Otto's ABC Studios. "Scenes of Germany Finest Inlayd Work Entirely Made by Hand of Various Natural Colred Woods of All The World"
Obviously this is no guarantee that our assumption of the picture's origin is correct, however, it does seem likely given the various clues such as the style of the work and the Gothic nature of the type face used. If you know anything about this picture which could help us to identify the maker and origins of this picture, we would be very pleased to hear from you. Just click the enquiry reply box on the column on the right if using Windows or E-mail info@marquetry.org if using any other system, and enlighten us - and all our many web visitors - with an answer to that puzzling Hamburg wood inlay picture origin question. 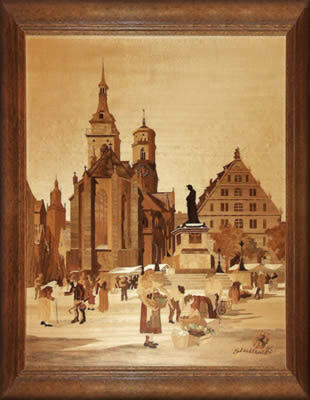 Our fourth piece for June is a superb reproduction of the beautifully detailed "Stuttgart" by Buchschmid and Gretaux. Once again we find the Prancing Horse logo on this picture. As for Ferrari, it seems that Enzo Ferrari won a race at the Circuito del Savio in 1923. As a result he was introduced to the local royalty, Count and Countess Barracca. Their son had been a celebrated Italian ace in WW1 and flew with a black rampant stallion painted on the side of his biplane. It is claimed it was actually the Stuttgart rampant horse, but no evidence is offered of this, and it does beg the question of why an Italian flyer would have the symbol of a German town on his aeroplane. Ferrari mentions the event in his 63 autobio, but doesn’t mention Stuttgart. We think that explains the riddle of the Prancing Horse on this lovely B & G wood inlay superbly. Click the above button to return to page 67 of "Can You Help"